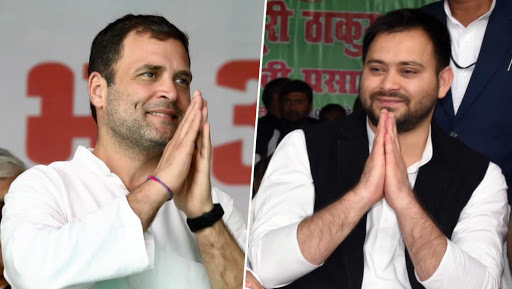 Patna, March 20: With the speculations going around that grand alliance in Bihar between Congress and its allies for the Lok Sabha Elections might get a hit, Rashtriya Janata Dal leader Tejashwi Yadav said on Wednesday that ‘Mahagathbandhan is intact’ and they would announce the seat sharing of constituencies after Holi. Asked on the condition of alliance with Congress and regional parties, RLD leader said, “Mahagathbandhan is intact, seats and constituencies will be announced after Holi. There is nothing to worry, all is fine in the alliance.” Bihar Lok Sabha Elections 2019 Schedule: Constituency Wise Dates Of Voting And Results For General Elections. Earlier, assuring the people about the continual of the grand alliance in Bihar, Loktantrik Janata Dal (LJD) chief Sharad Yadav had said their relationship with the Congress and other parties is intact, and they would contest the Lok Sabha elections together. He also informed that the seat-sharing information would be revealed that at a press conference on March 22. As per to the initial reports, after several rounds of hectic negotiations with alliances, it is expected that RJD would field 20 candidates while Congress would contest from nine seats. However, other allies like Upendra Kushwaha’s RSLP might get four seats, Jitan Ram Manjhi’s HAM(S) to get three, and Mukesh Sahni’s Vikasheel Insaf Party and Sharad Yadav’s Loktantrik Janata Dal can get two seats each. The delay was taking place in the alliance as Congress was mulling contest from 11 seats and was not in a mood to settle down below the numbers demanded. But with the changing circumstances in place, the central party has thought tactically and toned down for the united success of mahagatbandhan in the Lok Sabha Elections. On March 10, Election Commission had announced that the Lok Sabha elections would take place in seven phases – April 11, 18, 23, 29 and May 6, 12, 19. The elections in Bihar will take place in all the phases, and the results would be announced on May 23.